Need a pair of socks to match an outfit. Make your own in a few minutes. Lettuce Edged socks so cute and so easy to make. Pictured here are a pair with a double lettuce edge and a single lettuce edge. We made ours with our serger, but did experiment with the regular sewing machine (one of the orange edges) and that worked also. The serger is, of course, faster. Thread: Wooly Nylon works best (we've seen these) but anything will do just fine. I tend to be the type of person who uses what I have, so we used embroidery thread on the orange ones (the only orange thread I had) and regular thread on the pink ones. We've also seen some done with varigated thread...so cute. Single fold socks: Ours are the cheap ones from WM or the dollar store. 1. Set your machine for a rolled hem. 2. Put the colored thread in the upper looper, white in the rest. 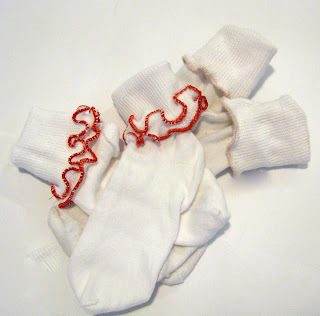 -Sew on the right (folded) side of your sock. -Stretch the sock edge as you sew, avoid the cutter bar. (If you cut the sock, it's ok, but best not to. 1. Set your machine for a satin stitch (very close zig zag). 2. Put the colored thread in the top, white in the bottom. -Stretch the sock edge as you sew, you may need to help guide the sock through to get good coverage, but be careful to allow the feed dogs to do their job. Sew around twice if using regular thread. 1. Sew the outside edge first, then fold the sock to create an inside edge and sew, with either machine. Don't forget to "Challenge Me"! This will be fun. And...we are at 97 followers, so a "Follow Me" winner will be announced soon. Adorable! So easy, too! Thanks! I don't understand the instructions for making a second ruffle. 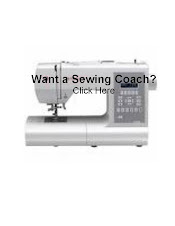 Could you explain how you what you mean by "old the sock to create an inside edge and sew." Don't suppose you have a picture? Holly-after you lettuce the edge of the sock, fold it down (like you are cuffing it) about an 1" or so, then lettuce on the edge of that fold to make the second row. You can lettuce anywhere you have or create an edge to stitch onto. If I'm still unclear, I'll make a pair and take a picture of that step. Let me know.